From the moment you step into the auditorium of The Liverpool Empire Theatre, the entertainment never stop during the touring production of Cameron Mackintosh’s revisited version of Barnum with conjurers, jugglers, acrobats and fire eaters patrolling the aisles as the call of “Roll up, Roll up” rumbles from back stage. This is the first time Barnum has been seen here and in order to fill the building’s vast stage, it needs to be big so as to give a proper sense of the vastness of what Phineas Taylor Barnum created during the mid and late 19th century. Is it big enough? Most definitely and seems to keep on growing as the evening progresses, with more lights than those seen at a NASA landing strip on a set that barely changes but nevertheless perfectly depicts the required scenes of Big Top, hotel and opera house auditorium. 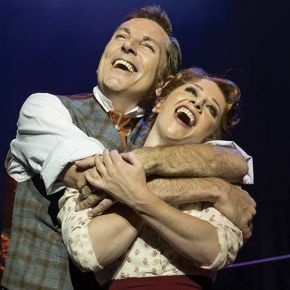 The costumes are all glorious, giving yet more sparkle, glamour and colour, and the music is guaranteed to have toes tapping and jaws gaping as Brian Conley in the title role manages to get his head and fine singing voice around some linguistically twisting lyrics. Without question it is Conley who provides the real pizzazz with his boyish mischief, adroit sleight of hand, energy, skill and overall charm really coming to the fore as he guides us through the highs and lows of the life of a man who, when all is said and done, was the most successful impresario quite possibly the world has ever seen, whilst never forgetting that this is an entertainment of the highest order. Yet it is not only Conley who glitters, but also Linzi Hateley who as his wife, Chairy, has nailed down the very essence of what it must have been to keep this human whirlwind’s feet firmly on the ground but often unsuccessfully, fortunately for us. Her rich singing voice is a joy to hear, but it is her poise and elegance in a part that might so easily become overwhelmed that is truly admirable. As Jenny Lind – a Swedish opera singer who made Barnum a comparative millionaire in six months under his blustering, marketing wing – Kimberly Blake is mesmerising, reaching notes that are as high as the ceiling and delivering a mystique to her character that leaves the audience wondering whether she and Barnum did a little more together than just attend lavish dinners and functions whilst on tour. Barnum built his reputation on providing spectacle, whether they be reputedly The World’s Oldest Woman in Joice Heth – played magnificently here by Landi Oshinowo – or the world’s smallest man in General Tom Thumb, brought to life on stage with a clever use of over sized props and the exquisite performance of Mikey Jay-Heath, who somehow manages to inject even more gusto into proceedings, aided and abetted by Jumbo: The World’s Largest Elephant. With some magnificent songs, with Come Follow the Band, There’s A Sucker Born Every Minute and The Colours of My Life being the cornerstones, some marvellous effects and an overall Feel Good Factor along with the self-perpetuating sense of nothing being impossible seeping from every moment, Barnum is one special show that deserves every plaudit that will inevitably tumble, twist and turn its way.